Back on July 15th my neighbor Joe combined my oats. He has a John Deere combine. His custom harvesting rate is $25 per acre. 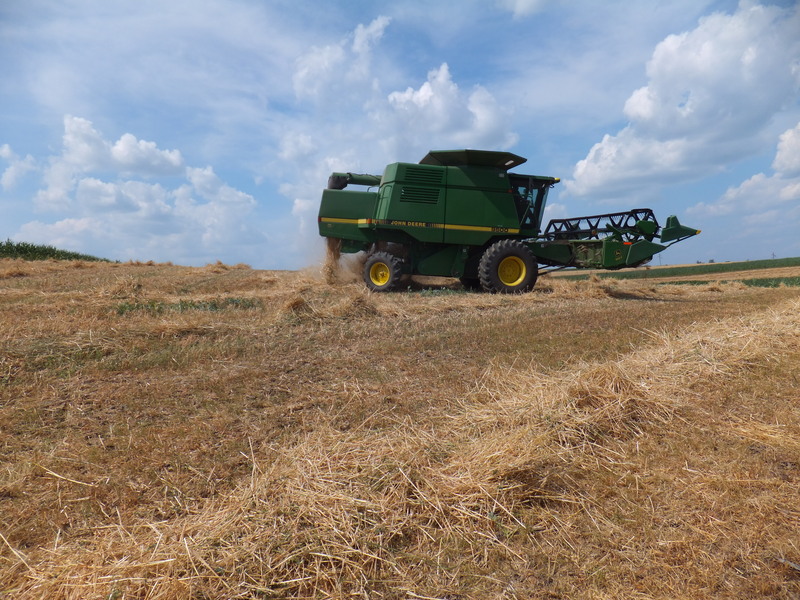 The combine cuts the oats and takes it inside the machine where it separates the grain from the straw. The grain fills a hopper while the straw is kicked out the back. 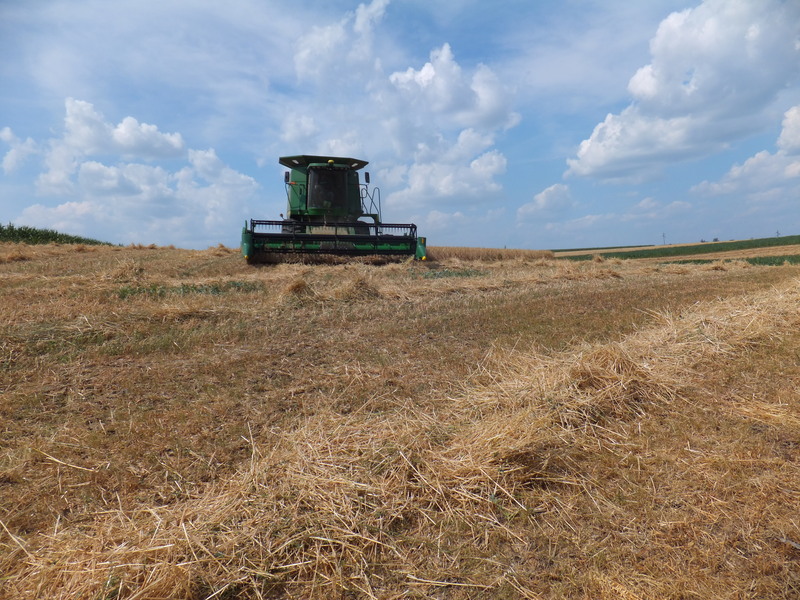 I waited a day and then raked and baled the straw to use for animal bedding. The oats yielded ok, especially considering the drought. 74 bushels, or 2368 lbs. per acre. They were super-dry, only 4% moisture. I understand now why small grains like oats, barley, or wheat do so well in the near west. Moisture in the spring helps the crop get a jump on the weeds, then when it turns dry it’s the only plant growing. 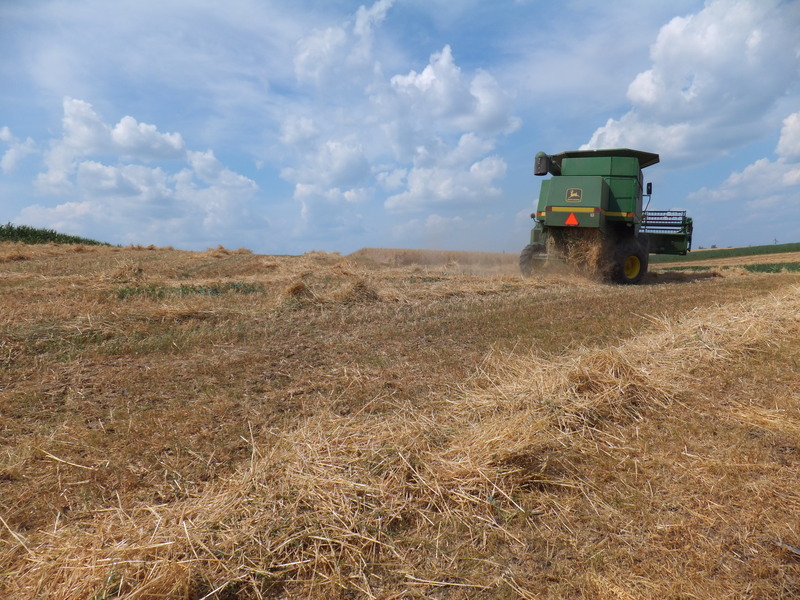 We struggle some in the midwest because we get more rain than they do out west, which is a blessing, but it also causes the weeds to grow up through the maturing oats, resulting in harvest troubles. This year the oats were weed-free and stood perfectly. Remember last year when a storm blew them flat? No troubles this year. This entry was posted on Tuesday, August 28th, 2012 at 12:07 pm and is filed under Curious crops. You can follow any responses to this entry through the RSS 2.0 feed. You can leave a response, or trackback from your own site. The sky in those photos is amazing!! Thanks Toasted! I thought so too.